Deckle Edge Literary Festival 2019 kicks off on March 22nd! 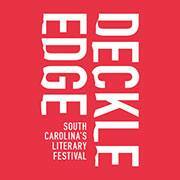 Join us as we welcome South Carolina author Dorothy Allison as our 2019 keynote speaker and the recipient of the second annual Deckle Edge Literary Festival Southern Truth Award. Alison will speak at the Booker T. Washington auditorium at the University of South Carolina on Friday, March 22nd at 7 pm in an engagement sponsored by the USC Women’s and Gender Studies Program. The event will be followed by a book signing with Dorothy Allison.